If it’s true that you are what you eat, Jeff and I have dual identities. During the work week, I’m known as Salad (my friends call me Sal), and this is my husband, Veg. Mondays through Thursdays, our dinner routine is for the most part just that: routine. I fix a chopped salad for me and Jeff stir-fries veggies for himself. Not that the routine isn’t tasty and satisfying and, in its own way, essential — it just doesn’t vary much. Weekends are a different story — we cook bold dishes. We eat out. Our identities revel in spice and richness; they relish the perfect dumpling or plate of pasta dressed in butter and cheese and cream; they savor the crisp rind of roast pork; they quench the thirst for wine. Weekends are delicious. In food, as in most of life, balance is key. But traveling through France, our weekday identities were continually tested. On day one, Jeff was already craving vegetables, and by day four, after a steady diet of duck and goose liver, we came to terms with the idea that veggies and salad may not find a prominent place on the menu for another 10 days. 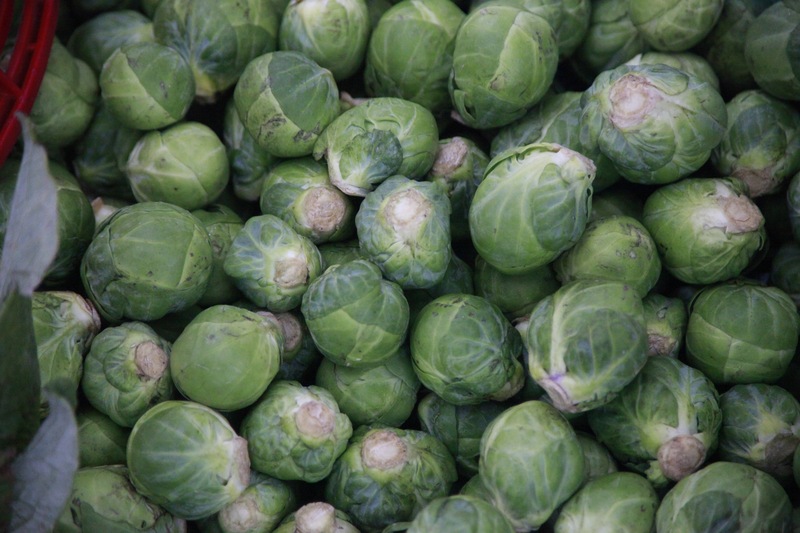 Strange, too, since the markets we visited overflowed with tantalizingly beautiful produce. And then, a miracle happened: salade Lyonnaise. The perfect balance of weekday and weekend identities. A mound of lovely torn bitter greens, usually frisee or curly endive, dressed in Dijon vinaigrette; a generous strewing of chewy, salty, thick-cut lardon; crispy, butter-toasted croutons; all topped by a soft poached egg. A tap of the fork opens the yolk, spilling yellow richness onto the ingredients below. Technically a salad, but so much more. James decided it would make a beautiful breakfast. Why not? Suddenly Tuesday is best friends with Saturday, dinner is breakfast, and all is right with the world. 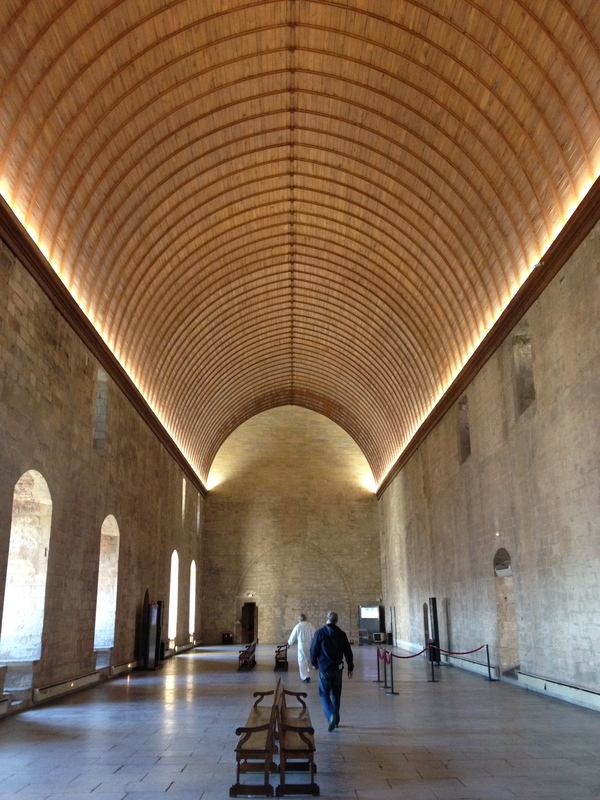 The grand dining room at the Palais des Papes. The Setup: Our final day with Kelly, and he was eager to introduce us to Avignon, his stomping grounds. We piled into our vehicles and headed into the city for a day of sightseeing. We started with a walk around the grounds of the Palais des Papes, then took a tour of the palace, where our group unraveled into smaller bunches. Afterward, pooped and hungry, Kelly, Jeff and I met up with Brett, Amy and Aiden and the hometown guy steered us through the streets to a nearby restaurant, L’Essential. Small, bright, modern and quite upscale, the dining room was still nearly filled with fancy lunch patrons finishing their meals. We took a table near the back and contemplated the menu. As at many restaurants we’d visited, L’Essential’s menu of the day was less expensive than choosing a la carte. Yesterday’s stuffing still fresh in my memory, I briefly considered ordering just one item, but in the end it didn’t make sense from a dollars-and-cents standpoint. Onward I went into another delicious three-course midday meal. 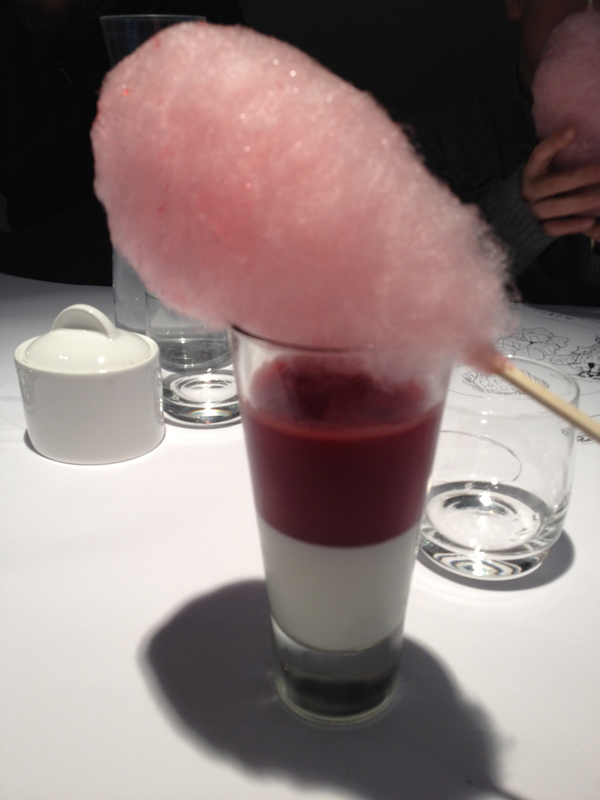 Raspberry parfait with cotton candy. The Feast: Up first, butternut squash soup, poured at the table into a deep wide bowl containing a creamy cannelle topped with thinly sliced mushrooms. 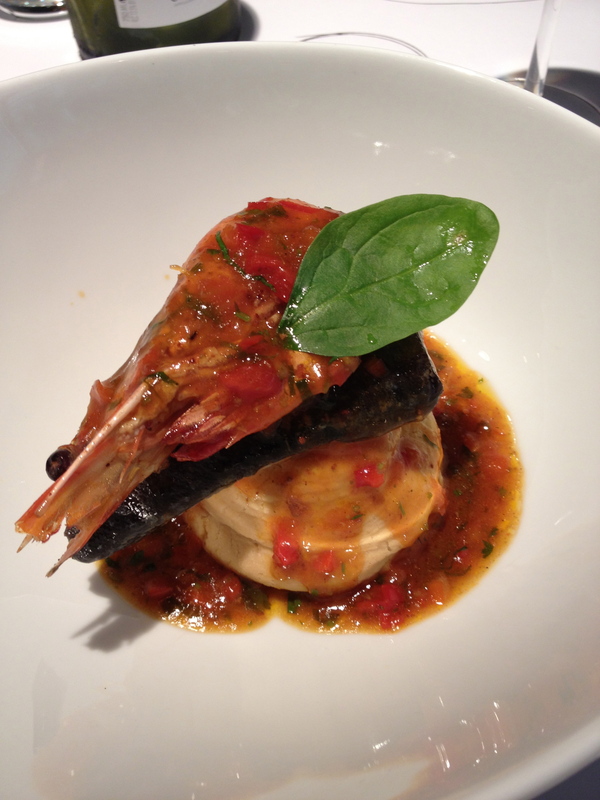 The main course brought a lovely little tower of crispy polenta and flaky cod crowned by a giant prawn, served in an herbed tomato sauce. Then the dessert I could have done without appeared: a fancifully garish highball glass half-filled with yogurt, half with raspberry sauce. Across the rim of the glass rested a puff of pink cotton candy. It was mocking me, I was sure of it. The yogurt and raspberries were cool, creamy and bright, and thankfully Aiden was more than willing to take one for the team and eat my cotton candy — in addition to his mother’s. Most Memorable: Another beautiful restaurant, another lovely meal. But I’ll remember the sight of well-coiffed French patrons swirling pink wisps of cotton candy around their tongues. 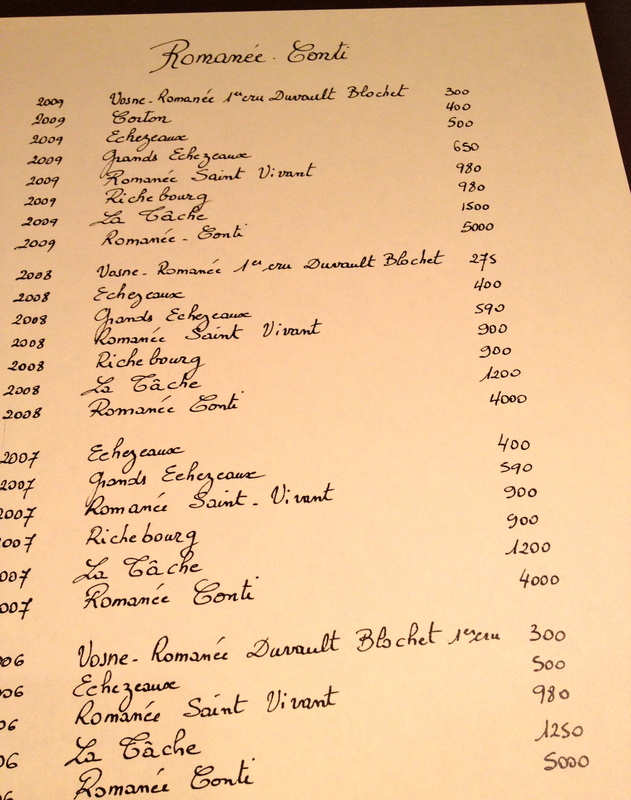 La Beaugravière’s handwritten wine list. The Setup: Our final night in Provence also marked Kelly’s last night with us, and a celebration was in order. La Beaugravière in Mondragon is known for showcasing the region’s truffles in traditional dishes. To get there, we had to drive through the Provencal countryside for about an hour. When we arrived at nearly 9 pm, the spacious dining room was still humming, a few large tables hosting what looked like family gatherings. Our large group took seats at a vast table next to the crackling fire and marveled at the wine list, a voluminous tome entirely handwritten in perfect curly script. The Feast: Most of us went for the deluxe truffle tasting menu, regularly priced at 120€, but this night, for us, they offered it at 100€, a relative bargain. Jeff, Zandra and I, unable to bear the thought of another gut-busting binge, decided on a more moderate menu with fewer courses. 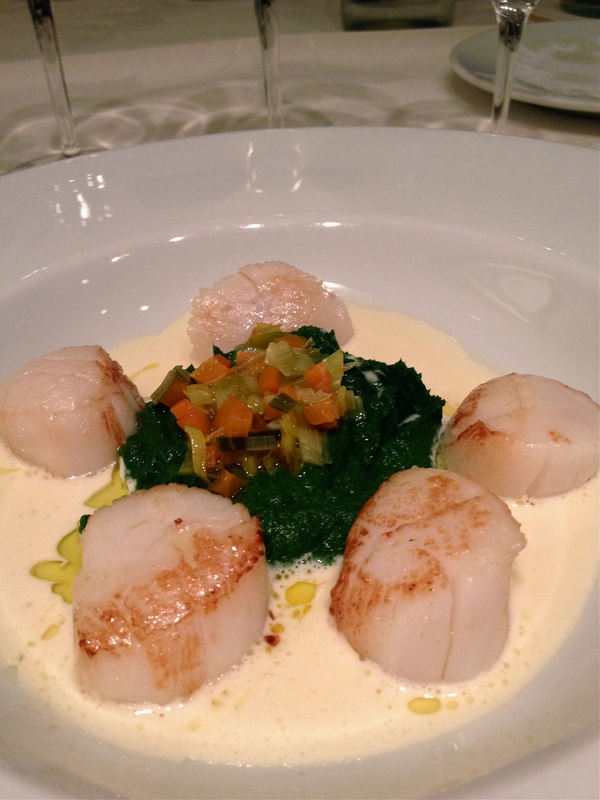 Our meal started with beautifully plump seared sea scallops and a dollop of spinach puree in a buttery cream sauce. Simple, light-ish, off to a good start. According to the menu we were not supposed to have a second course, but the concept of the Empty Plate was apparently not practiced here and we were served a familiar and always satisfying butternut squash veloute. The main course of the “light” menu featured the region’s famous, plump-and-pampered Poulet de Bresse, ours roasted and served with mushrooms and a spoonful of custard-like cake filled squash and other vegetables. The others in our party were treated to the same roasted poulet with truffles tucked under the skin. A restrained cheese course followed (only two pieces), and then dessert: orange laden crepes Suzette for me and a raveable apple tarte for Jeff and Zandra. Two, sometimes three wines with each course was now standard, and tonight was no different. Kelly shows us one of the cellar’s finest. 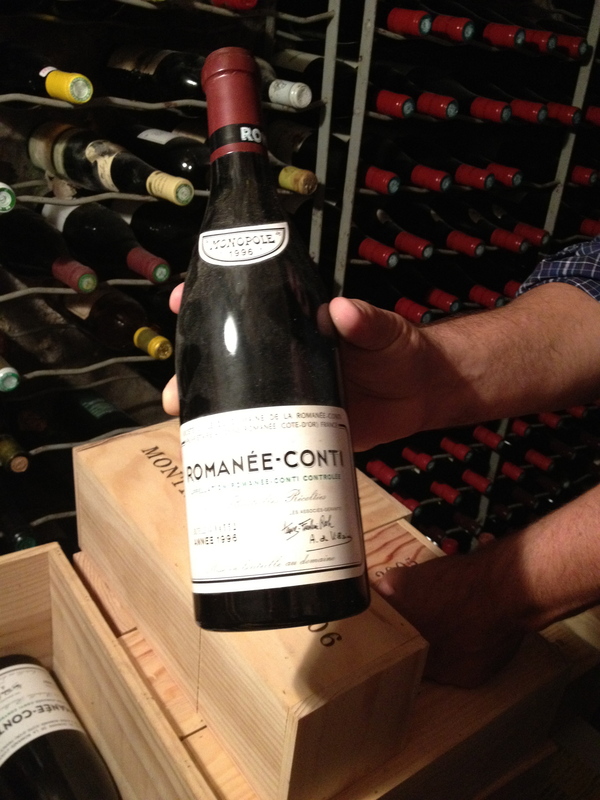 After dinner, Kelly treated us to a brief tour of the restaurant’s basement wine cellar. A creaky narrow wooden stairway descended to a musty low-ceilinged labyrinth of shelves and stacked crates, filled with wine bottles sporting faded labels and vintages spanning the 20th Century. Just another evening with Kelly. Quite a treat. Most Memorable: The meal itself was rich and remarkable, but this night is remembered bittersweetly as our last with Kelly. After dinner, in the parking lot, we said goodbye to our friend with three alternating cheek kisses as is tradition in the region. Bise, bise, bise … multiplied by 11. The Setup: The high-speed rail made short work of the kilometers between Avignon and Lyon, and we arrived with enough time for a quick lunch before our afternoon appointment. Jack discussed nearby options with the hotel’s front desk, and we headed a couple of streets over to a little bouchon, Restaurant Aux 3 Maries. Upstairs, in an area quieter than the bustling dining room below, we sat at a large table by the window. Egg, lardons, crouton. Oh, and greens. The Feast: Compared to the truffle banquent of the previous night, this meal was relatively light and casual, with each of us ordering just two small courses. 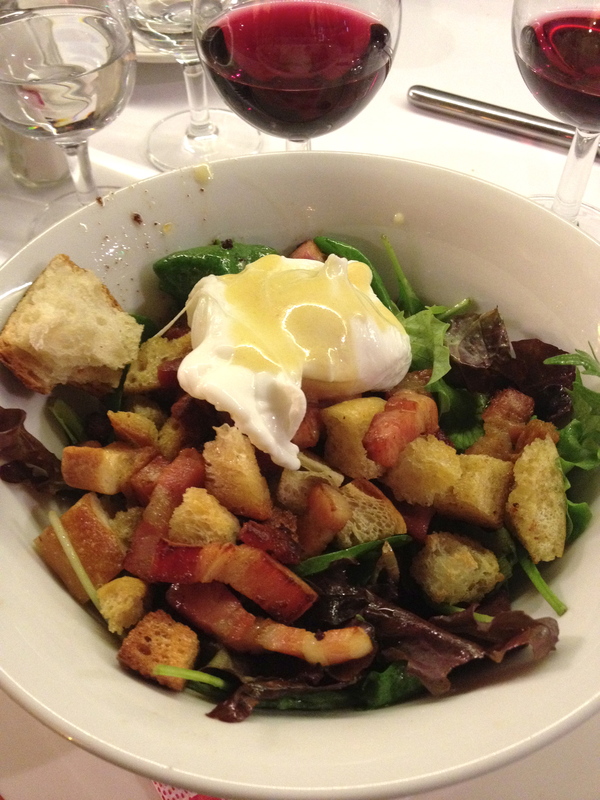 I started with salade Lyonnaise, as did a few others at the table. My second course: a few wedges of salty, creamy cheese with baguette. Lovely and light. Jeff, James and Amy were tempted by the andouille sausage listed on the menu, but when it arrived it was not the familiar, spicy encased meat we’re accustomed to in the States. This andouille was a looser sausage with a pungent, gamey aroma and flavor. It was only after lunch that we learned the sausages’ primary ingredient was tripe. Well, that would explain things. 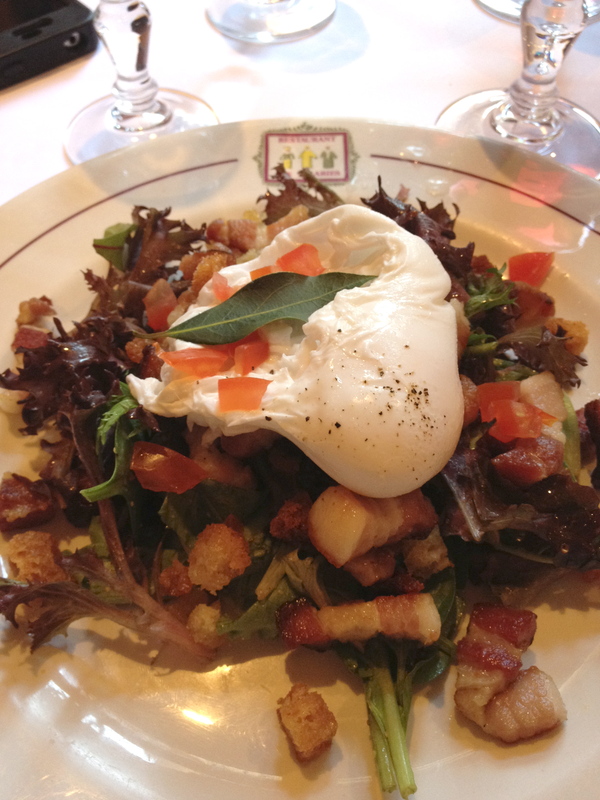 Most Memorable: That splendid moment when the egg yolk ruptures, cascading over the salade Lyonnaise. Heaven. Comforting gratineed onion soup made richer by egg yolk in sherry. The Setup: Our final day in France. We spent the morning trying to keep up with our fast-walking guide, who took us on a circuitous tour through traboules and markets, past the old cathedral whose detailed carved facade comprised a multitude of ancient stories and characters, to a silk atelier, and eventually over the Rhone into the more modern part of town, where we ended at Les Halles de Lyon, the enormous marketplace of food purveyors and cafes. (I envy the U.S. cities that support these Euro-style markets and feel fortunate that Portland may soon be home to one.) We wandered for a bit, tasting a few samples, then said goodbye to our guide. Then back to old town, where we found a cute, casual two-story bouchon tucked in an alleyway. Up the impossibly narrow spiral staircase we went, to the lengthy, narrow second-floor dining room, much of whose space was consumed by our large table. It was here that we parted ways with our friend Jack (many hugs and handshakes) and here that we met yet another good-natured waitress, who traversed the tight ringlet of a staircase a dozen times carrying plates of food and bottles of wine, feigning fatigue and mock exasperation. The Feast: The menu was filled with traditional Lyonnaise dishes, each one so tempting it was difficult to choose. Having fallen for it the day before, I started with salade Lyonnaise. After that, French onion soup gooey with melted cheese and soft caramelized onions. But this version had a kicker: On the side was a ramekin with a raw egg yolk and a bit of sherry meant to be stirred into the soup for even more delicious richness. An unbelievably wonderful idea. Other dishes at our grand table included a hearty, sweet-tinged chestnut soup and incredibly rich pasta in a dense cream sauce. With Kelly not there to guide our wine choices, we ordered one at the suggestion of the waitress and proceeded to drink a total of five bottles. Heathens. Most Memorable: The addition of the egg yolk in sherry added a luscious richness to an already-rich soup. But even more memorable was our server, whose sweetness and good sense of humor shone despite having to make several trips carrying dishes up and down those narrow, winding stairs. Great way to cap off our most memorable of vacations. When people ask, I gush about about our trip to France, but my words fail to do it justice. Gradually I’ve arrived at a quick, digestible version that most people can relate to: the food, the wine, the people, the countryside, it was all amazing. Fifteen glorious, fast-paced days. Eleven great people. Eight versions of butternut squash soup. There is so much that we did and saw that I didn’t even begin to touch on here. All the chateaux and wineries; the many medieval villages and castles; pizza in Sarlat; pho in Lyon; the private tour of the caves in Dordogne; more foie gras than we could begin to quantify. I am so grateful to our travel companions, a wonderful family who so generously invited us into their fold. It was an adventure we’ll never forget. You didn’t eat your cotton candy? I don’t know which I like more—the egg on top of the Salad Lyonnaise or the egg yolk and sherry mixed with the French Onion soup. Thanks for winding us through your fabulous trip, I felt like I was there while I was reading it. 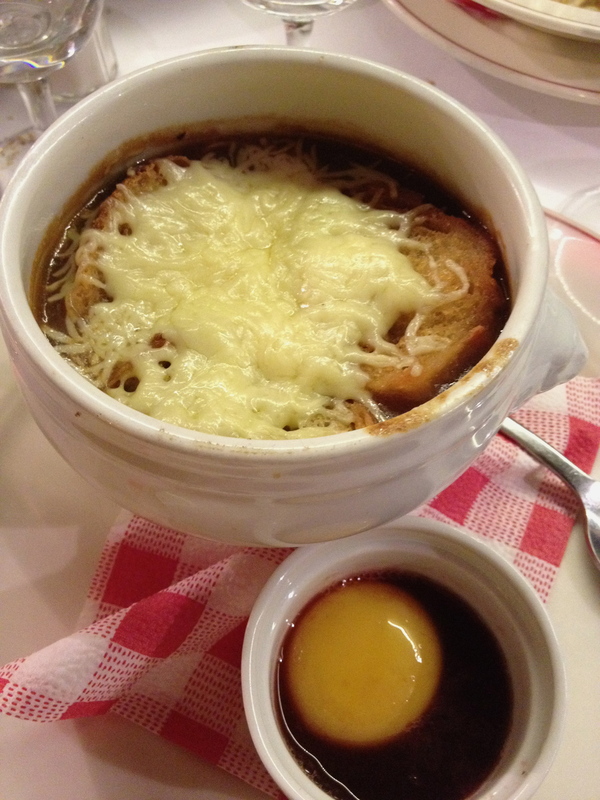 The egg yolk with sherry in the onion soup was sheer genius! Thanks for reading it, sis.